Each bed is held together with pieces of hardwood and roofing screws. Next time I will sand the sharp edges off the corner of the wood. When building the beds I highly recommend that the cut edge is on the bottom of the bed and the curve of the corrugate is pointing into the centre of the beds. I have ripped numerous holes in the leg of my pants after catching my leg on the corner of a bed that has been constructed the wrong way! It will take two peole to move the bed into position. 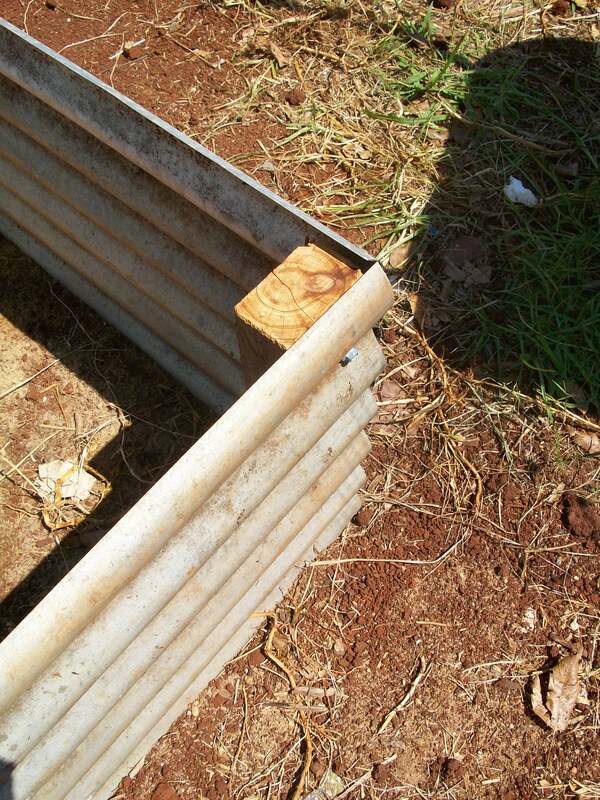 Now is a good time to thump a short steel post halfway along the length to support the walls of the bed. We have not done this and the beds are starting to bulge in the middle. 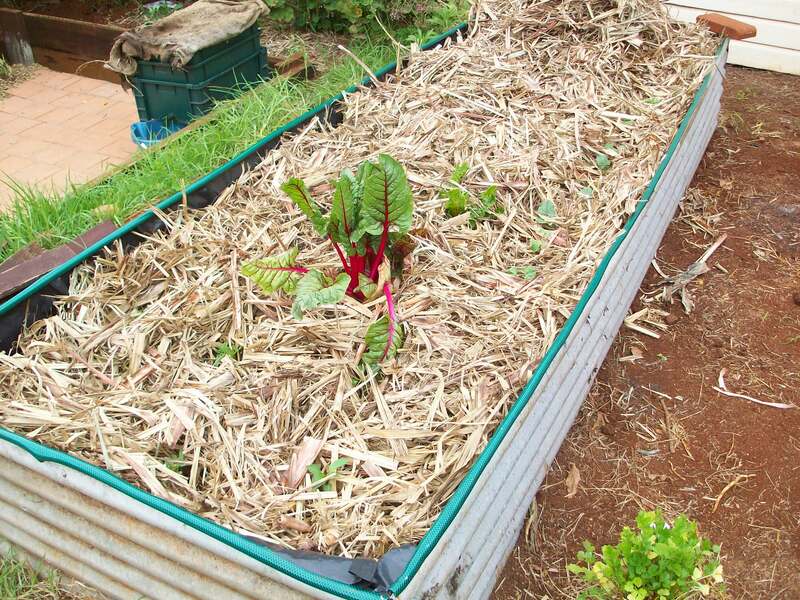 Once in position a large V shape is dug out, up the length of the bed. It is roughly 15 to 20cm deep. Next the bed is lined with plastic. This is 200um plastic it is slightly thicker and more durable than the 100um. Then the V shape is filled with peddles. We used pebbles as it is what we had on hand. Sand is also another product that is commonly used. In the V is where extra water will be held when there is heavy rains. As soil has capillary action it will draw-up any water needed when the soil begins to dry out. 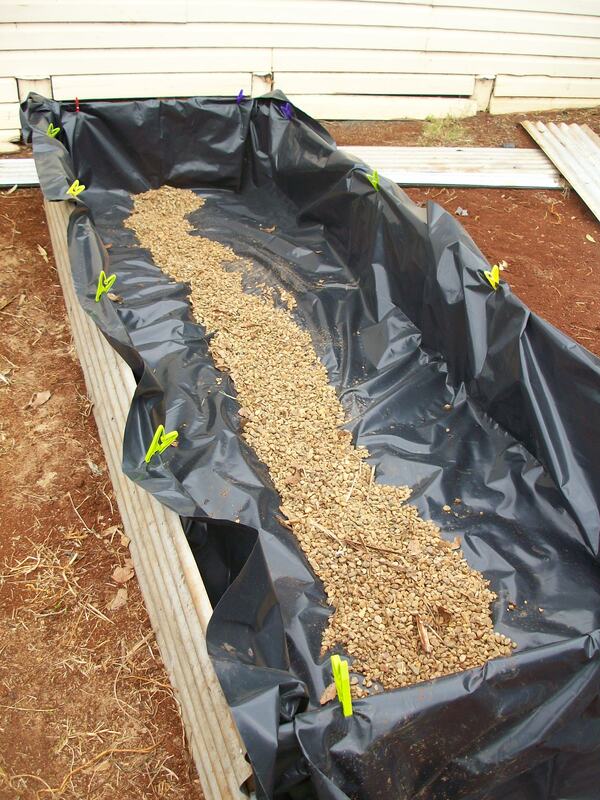 In traditional wicking beds the plastic only comes up half way. However we have very invasive roots in our yard so we have brought the plastic up to the top. Also we chose not to include the irrigation pipe in the design, a bit of a gamble however so far the beds are staying fairly moist with only overhead watering. Now fill the bed in with clean soil. Ours also contains compost, manures and dymanic lifter. The beds take alot of dirt, if my maths is right 1.5 cubic metres. Then mulch well. After mulching I water the bed with several big buckets of final rinse water from the laundry. Our soil was quite dry when placed into the gardens, this water helped to increase the initial saturation in the soil. Around the tops of the beds we placed garden hose to stop the boys from cutting themselves. It has since been discovered that in the heat these tend to fall off. I think they will need to be wired on. The beds have become slightly water logged after heavy rainfalls. To overcome this 3 holes have been drilled into the corrugate and plastic about 15cm up from the bottom of the bed. Yeah, I think you’ll need the holes in the side. You want to keep the water to a pool in the bottom of the bed, and make sure it doesn’t fill the bed to the top or it’ll drown your vegies. I’ve been experimenting with wicking boxes (like wicking beds, but done in styrofoam broccoli boxes). It’s been great so far, very happy with them. And they don’t use much water, which is great. 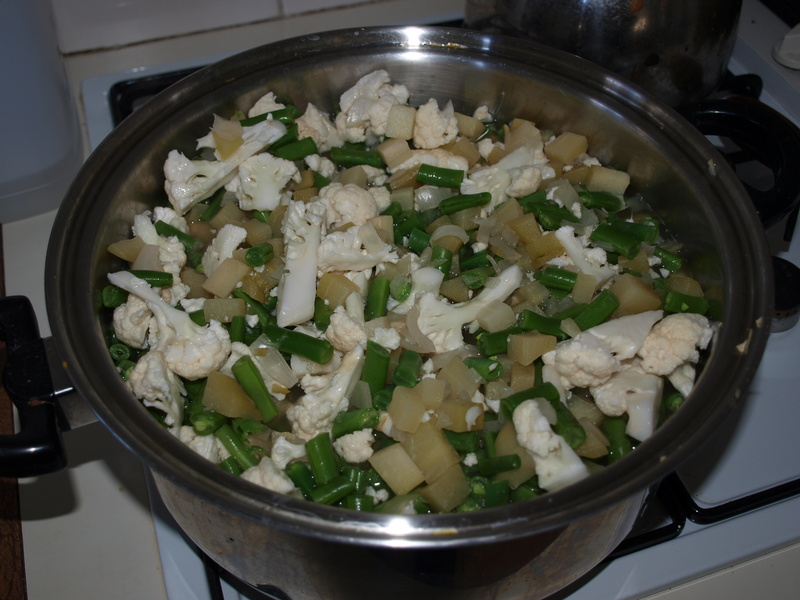 Hi Love your instructions very clear and good photos. My concern is you might not be getting the water to the very bottom of the bed when watering over head. 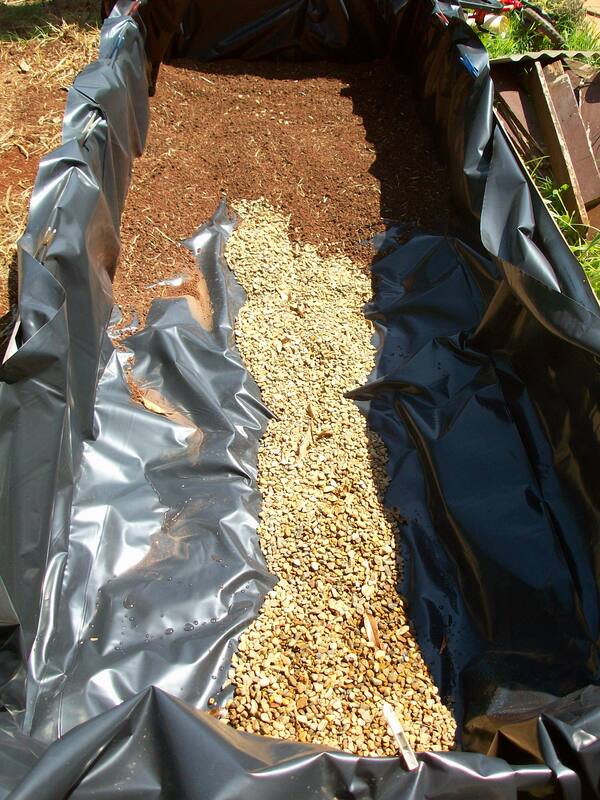 In other wicking beds it is good for the very top to be dry (except when planting seedling or seeds) so there is no chance of germination of weeds and with a pipe to deliver the water to the bottom, the wicking action takes care of the root zone. I do like your site as it is very similar to my situation. 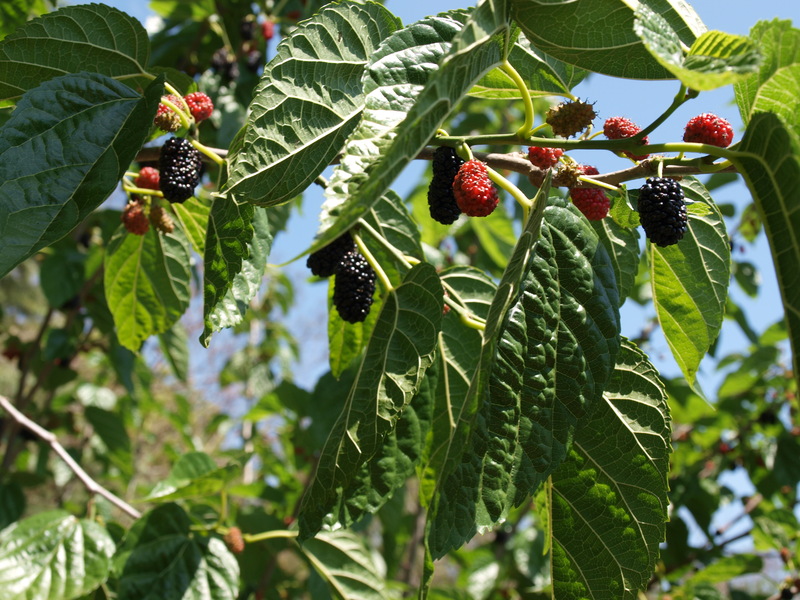 I am going to go 50/50 pots and ground for my fruit trees as when I move I don’t want to leave them.